MDMA is one of the most popular recreational psychoactives, most commonly sold as "ecstasy" (usually tablets) or "molly" (usually crystals). It is known for its empathogenic, euphoric, and stimulant effects, and has also been used in psychotherapy. Ecstasy tablets are notoriously impure, often containing chemicals other than MDMA. See Ecstasydata.org for pill testing results. In 2016, some ecstasy tablets containing dangerously high doses of MDMA have been found in the EU. 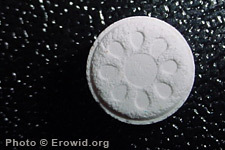 The slang name "molly" is traditionally used to refer to pure MDMA. However, other chemicals such as ethylone, methylone, and MDPV are often sold as "molly". Is snorting MDMA worse for you than taking it orally? Austrian Drug Checking - ChEckiT!